Sammy Lees Motors are delighted to welcome into stock this ONE owner 2016 Ford Galaxy 2.0L Titanium X TDCI with 177 BHP. Finished in the gorgeous Frozen White which is perfectly complimented by a luxurious full Black Leather upholstery including heated front seats & 18" 5 double spoke alloy wheels. The Ford Galaxy Titanium X is the top-of-the-range edition of the brand's biggest MPV. Because of that, the Titanium X comes with luxuries like an electrically operated panoramic roof and a reversing camera. Other equipment includes Ford's SYNC 2 infotainment system with satellite navigation and DAB radio, climate control and power foldable door mirrors. 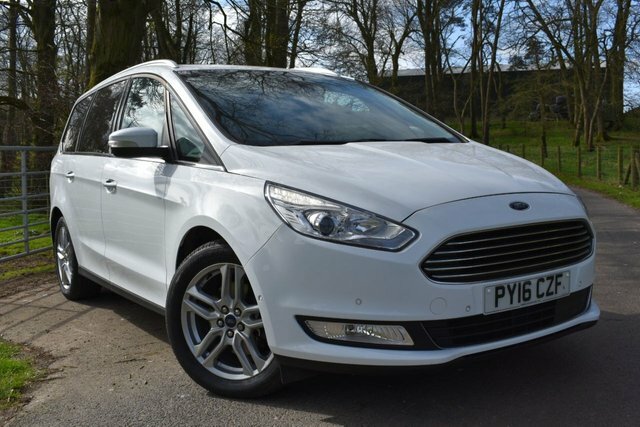 This vehicle benefits from a full detailed Ford service history having been serviced at 12,245 miles on 11.6.18 & will receive a full detailed service as well as 12 months MOT & 1 years full FREE in house warranty - offering complete peace of mind. This immaculate & high specification vehicle comes with : - * Sat Nav, Reversing Camera, * Panoramic Roof, * DAB Radio, Bluetooth Connectivity, * Cruise Control, * Dual Zone Climate Control, * Colour Touch Screen Audio Visual Display, * Rear Privacy Glass, * Front & Rear Parking Sensors, * Driver Memory, * Auto headlights, * Leather Multi Functional Steering Wheel, * ISOFIX, * 2 Remote Control Key Fobs, * Ford Handbook Pack + Much More! 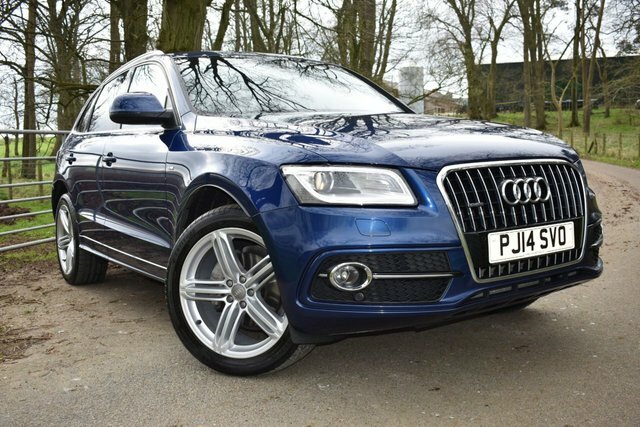 Sammy Lees Motors are delighted to welcome into stock this 2014 Audi Q5 2.0L TDI Quattro S Line Plus Auto with 187 BHP. Finished in the beautiful Scuba Blue Metallic which is perfectly complimented by a full Black Nappa Leather upholstery including heated front seats & 20" 5 triple spoke alloy wheels. The Q5 is part of the new generation of soft-roaders hitting the UK's roads. Capable of tackling country roads, motorways & fields all in the same sitting, These vehicles are versatile & sturdy while still offering good economy & value for money. The subtle sports bodykit also helps give the Q5 extra presence & appeal on the road compared to the somewhat bland-looking standard car. This vehicle benefits from a full Audi detailed service history having been serviced at 16,939 miles on 29.6.16, 19,126 miles on 8.6.17 & will receive a full detailed service & 12 months MOT prior to customer collection as well as 1 years full FREE in house warranty - offering complete peace of mind. This immaculate & high specification vehicle comes with the following: - * Colour Satellite Navigation, * Cruise Control, * DAB Radio/CD Player, * Bluetooth Connectivity, * Leather Multi Functional Steering Wheel, * Electronic Hand Brake, * Black Cloth Headlining, * Colour Coded Parking Sensors, * Chrome Exhaust, * S Line Embossed Scuff Plates, * Automatic Headlights, * Electric Tail Gate, * Xenon Headlights, * Rear Privacy Glass, * Front Fog Lights, * Audi Handbook Pack, * ISOFIX, * 2 Remote Control Key Fobs + Much More! Sammy Lees Motors are delighted to welcome into stock as the result of a local part exchange this ONE owner 2016 Audi Q3 2.0L TDI Quattro S Line Plus with 148 BHP. Finished in the stunning Hainan Blue Metallic which is perfectly complimented by a luxurious half Black Nappa Leather & Alcantara Cloth S Line embossed upholstery including heated front seats & upgraded 19" 5 double spoke alloy wheels. The Audi Q3 is a practical, well-built and desirable crossover. 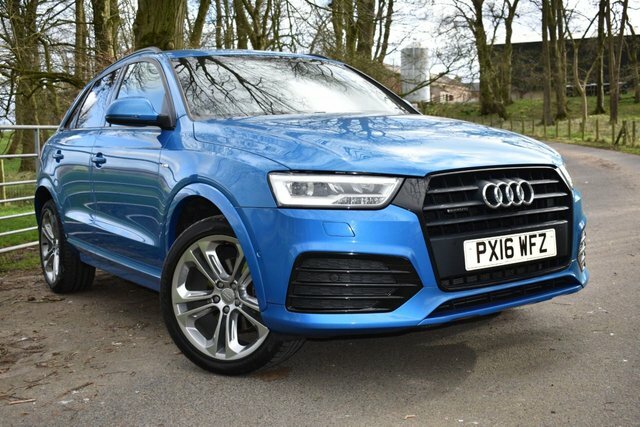 Its premium feel runs more than skin deep, as the compact Audi 4x4 offers an engaging, fun driving experience and genuine refinement thanks to solid design and engineering. Impeccable Audi build quality is reflected in a cabin that has a truly premium feel, too. This vehicle benefits from a full detailed service history having been serviced at 18,715 miles on 4.2.17, 28,216 miles on 7.9.17, 39,586 miles on 1.3.18, 47,845 miles on 29.8.18 & will come fully serviced with 12 months MOT as well as 1 years full FREE in house warranty - offering complete peace of mind. This immaculate & high specification vehicle comes with: - * Colour Reversing Camera, * Sat Nav, * Cruise Control, * Bluetooth Connectivity, * DAB Radio, * Dual Zone Climate Control, * Drive Select, * Parking Sensors/Parking Aid, * Electronic Tailgate, * Rear Privacy Glass, * Dual Chrome Exhaust, * Electronic Hand Brake, * Automatic Headlights, * Leather Multi Functional Steering Wheel. * ISOFIX, * 2 Remote Control Key Fobs, * Audi Hand Book Pack + Much More! Sammy Lees Motors are delighted to welcome into stock this 2014 63 Plate Mercedes-Benz M Class 2.1L ML250 Bluetec AMG Sport with 204 BHP. 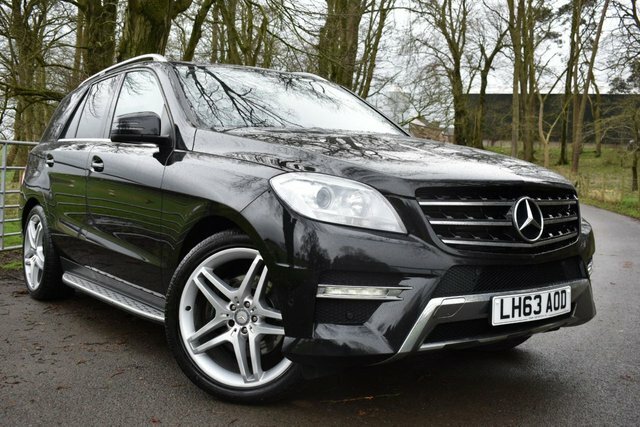 Finished in the glamorous Obsidian Black Metallic which is perfectly complimented by a luxurious half Black Leather upholstery including heated front seats & head turning 21" 5 double spoke AMG alloy wheels. Big, butch and bold, the Mercedes-Benz M-Class has never been a car for the shy and retiring. This is the third generation of the SUV – a car that has always tried to satisfy the desires of those after a rugged and capable off-road machine as well as a large and luxurious SUV. This vehicle benefits from a full detailed service history & will come fully serviced with 12 months MOT as well as 1 years full FREE in house warranty - offering complete peace of mind. This immaculate & high specification vehicle comes with : - * Sat Nav, * Cruise Control, * Dual Zone Climate Control, * Bluetooth Connectivity, * Rear Privacy Glass, * Electric Tail Gate, * Auto Headlights, * Parking Sensors, * Chrome Sport Foot Pedals, * ISOFIX, * 2 Remote Control Key Fobs, * Leather Mercedes Handbook Pack + Much More! 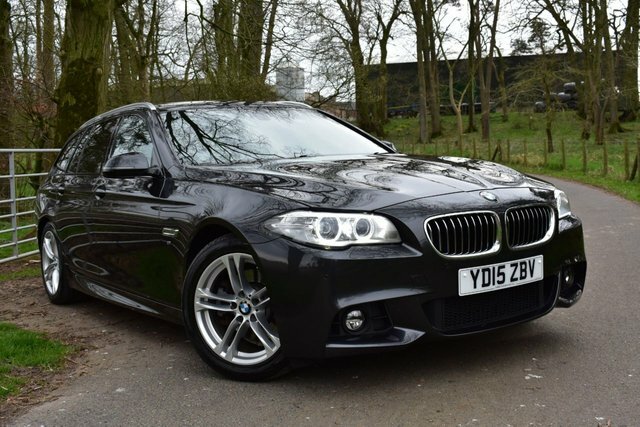 Sammy Lees Motors are delighted to welcome into stock as the result of a local part exchange this 2015 BMW 5 Series 520D M Sport Touring with 188 BHP. Finished in the gorgeous Azurite Black Metallic which is perfectly complimented by a luxurious full Black Leather upholstery including heated front seats & 18" 5 double spoke alloy wheels. The BMW 5 Series Touring is at the top of the executive estate car class, thanks to a perfect blend of performance and practicality with BMW claiming this vehicle will return an impressive average 60.1 miles per gallon on average. This vehicle benefits from a full detailed service history & will come fully serviced with 12 months MOT as well as 1 years full FREE in house warranty - offering complete peace of mind. This immaculate & high specification vehicle comes with : - Sat Nav, * Electric Tail Gate, * Cruise Control, * Bluetooth Connectivity, * Drive Select, * DAB Radio, * Black Cloth Headlining, * Auto Headlights, * Electronic Handbrake, * Dual Zone Climate Control, * Dual Sports Exhaust, * Leather Multi Functional Steering Wheel, * Detachable Tow Bar, * Front & Rear Parking Sensors, * Leather BMW Handbook Pack, * ISOFIX, * 2 Remote Control Key Fobs + Much More! Sammy Lees Motors are delighted to welcome into stock this ONE owner £30 road tax 2016 66 plate Mercedes - Benz A Class 2.1L A200 D AMG Line Executive with 134 BHP. 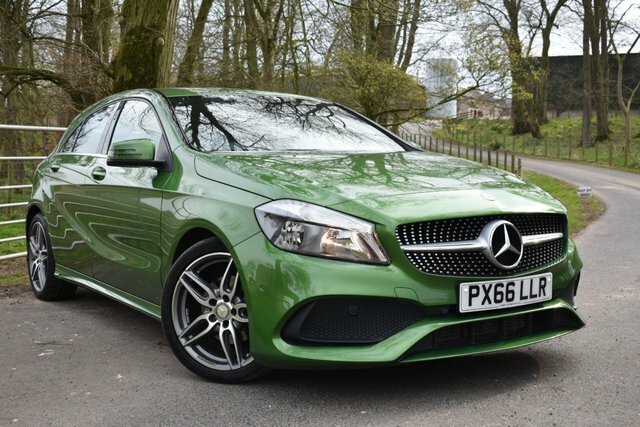 Finished in the eye catching Elbait Green which is perfectly complimented by Half Black Artico Leather & Dinamica Suede AMG sport seats including heated front seats & 18" 5 double spoke AMG alloy wheels. The Mercedes A-Class is one of the most upmarket, high-tech small cars on sale & sits in the premium segment of the hatchback market, going up against rivals such as the BMW 1 Series, Audi A3 and the Volkswagen Golf. This vehicle further benefits from a full detailed Mercedes Benz service history 9,562 miles on 4.8.17, 19,503 miles on 20.7.18 & will come fully serviced with 12 months MOT & 1 years full FREE in house warranty - offering complete peace of mind. This immaculate & high specification vehicle comes with the following : - * Colour Reversing Camera, * Sat Nav, * Bluetooth Connectivity, * Cruise Control, * Front & Rear Colour Coded Parking Sensors, * Drive Select, * Auto Headlights, * Chrome Sport Foot Pedals, * Leather Multi Functional Flat Bottomed Steering Wheel, * Dual Zone Climate Control, * Dual Chrome Exhaust, * Auto Stop/Start, * Black Cloth Headlining, * ISOFIX, * Mercedes Benz Handbook Pack, * 2 Remote Control Key Fobs + Much More! Sammy Lees Motors are delighted to welcome into stock as the result of a local part exchange this 2010 60 plate Land Rover Ranger Sport 3.0L TDV6 with 245 BHP. Finished in Santorini Black with a luxurious full Light Stone Beige Leather upholstery including both front & rear heated seats with driver memory & 20" 15 spoke alloy wheels. It may be a full-scale SUV to rival the Mercedes ML and Porsche Cayenne, but the Land Rover Range Rover Sport is still a serious off-roader. It can cope with terrain its rivals simply cannot contemplate, helped by Land Rover's excellent Terrain Response system. However, it's on the road where the Sport is most commonly found and it's equally adept here thanks to superb body control, agile handling and a ride that deals with all that British roads can throw at it. This vehicle benefits from a full detailed service history having been serviced at 10,211 miles on 21.9.11 by Land Rover, 18,377 miles on 11.10.12 by Land Rover, 24,447 miles on 25.9.13 by Land Rover, 31,962 miles on 13.9.14 by Land Rover, 39,567 miles on 25.9.15 by Land Rover, 44,529 miles on 13.9.16, 48,907 miles on 31.7.17, 53,962 miles on 21.6.18 & will receive a full detailed service prior to collection as well as 1 years full FREE warranty - offering complete peace of mind. This immaculate & high specification vehicle will come with : - * Sat Nav, * Television, * Reversing Camera, * DAB Radio, * Cruise Control, * Front & Rear Parking Sensors, * Dual Zone Climate Control, * Colour Touch Screen Audio Visual Display, * Key Less Push Button Start/Stop, * Leather Multi Functional Steering Wheel, * Harmen Karden Sound System, * Fridge, * Chrome Side Steps, * Rear Privacy Glass, * Range Rover Rubber Floor Mats, * Automatic Headlights & Windscreen Wipers, * Front & Rear Electric Windows, * Heated & Electric Wing Mirrors, * Chrome Range Rover Embossed Scuff Plates, * Ipod Point, * Automatic Hand Brake, * Split Tail Gate, * ISOFIX, * USB Port, 2 Remote Control Key Fobs, Leather Range Rover Hand Book Pack + Much More! Get the best deal on a used car for sale in Appleby In Westmorland by making your way to Sammy Lees Motors Ltd today. You'll find every available model listed here on the website, and as all our stock is competitively priced you should have no problem sourcing a pre-owned to suit your budget. Take the opportunity to browse our current range online before contacting a member of the showroom team to find out more. Our friendly and knowledgeable staff will be more than happy to answer any questions and provide advice and guidance when necessary. Alternatively, why not pay a visit to our showroom in person and take a closer look at the selection of used car models for sale.